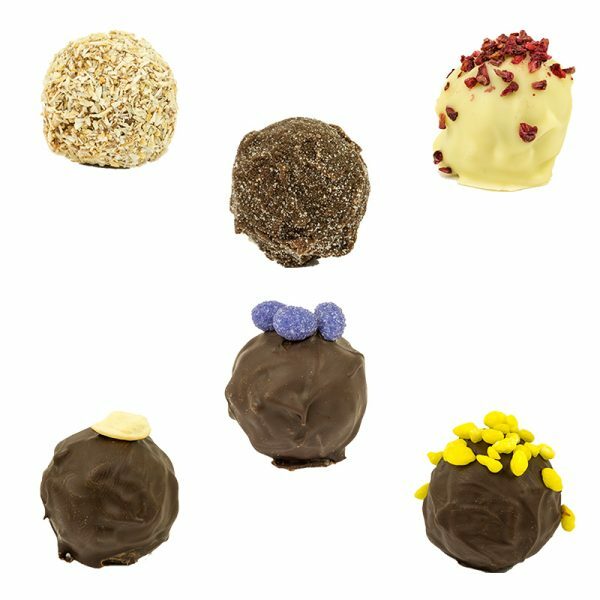 Indulge yourself in our selection of vegan truffles or treat someone special to our luxury vegan handmade truffles, handpicked by you. 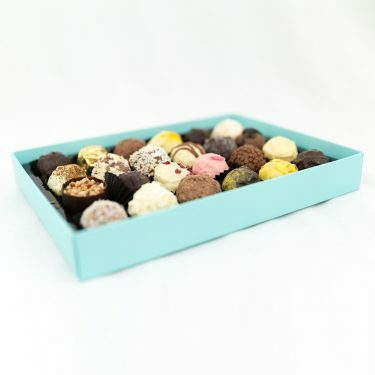 From our various selection of delicious chocolates, you will find something that will delight! 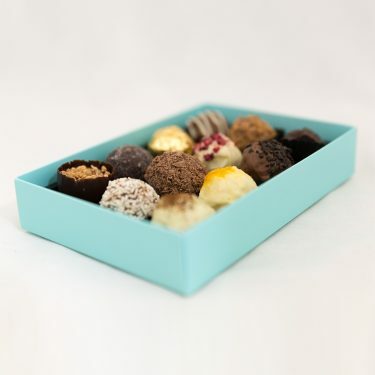 Enjoy… There are 12 truffles per box. 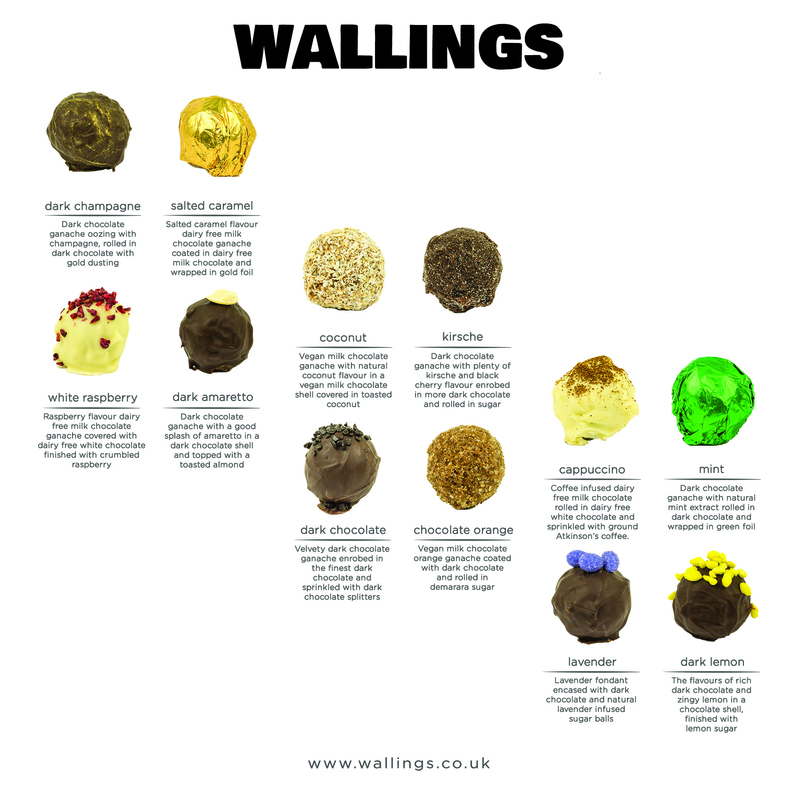 Descriptions and ingredients of individual vegan chocolates are listed in the tabs, allergens are listed in BOLD. 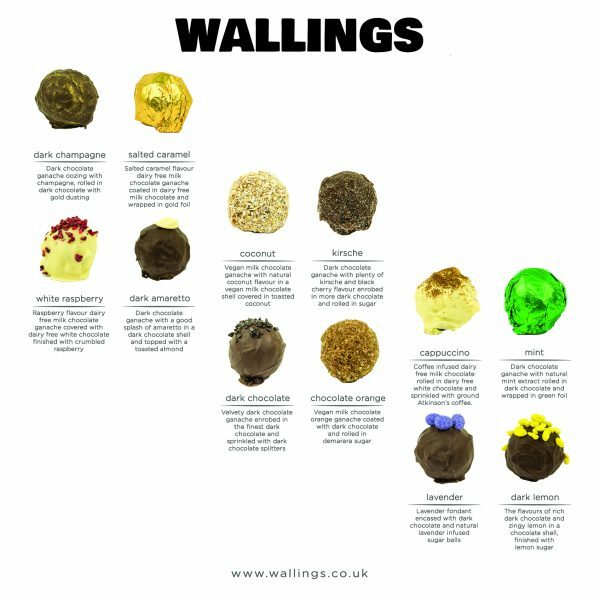 The contrasting flavours of rich dark chocolate and zingy lemon combined in a chocolate shell, finished with lemon sugar. 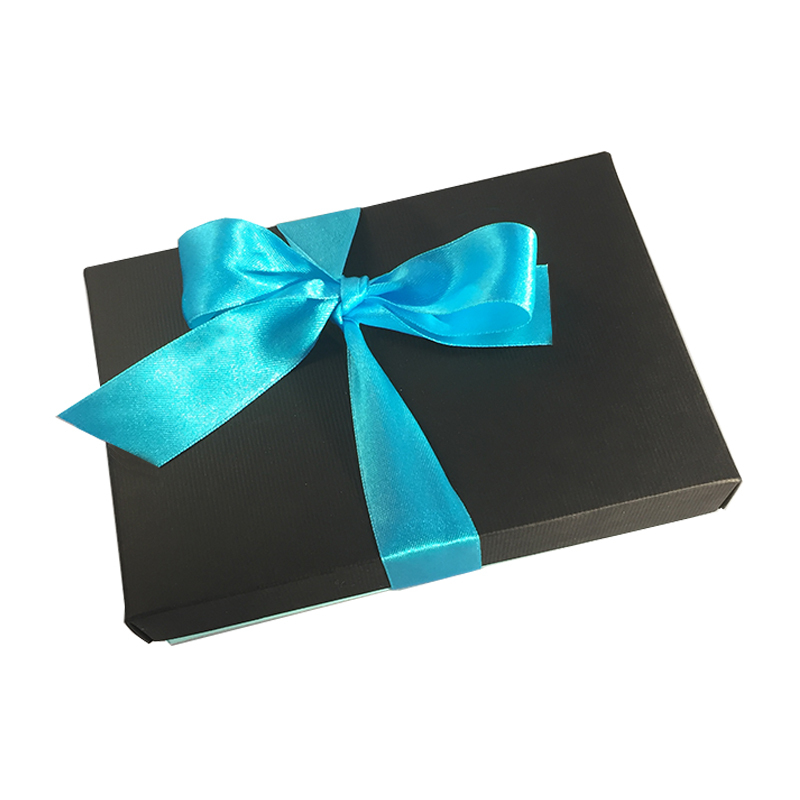 Dark chocolate ganache with natural mint extract rolled in dark chocolate and wrapped in green foil. Dark chocolate ganache with natural coconut flavour and coconut in a dark chocolate shell covered in toasted coconut. Velvety dark chocolate ganache enrobed in the finest dark chocolate and sprinkled with dark chocolate splitters. 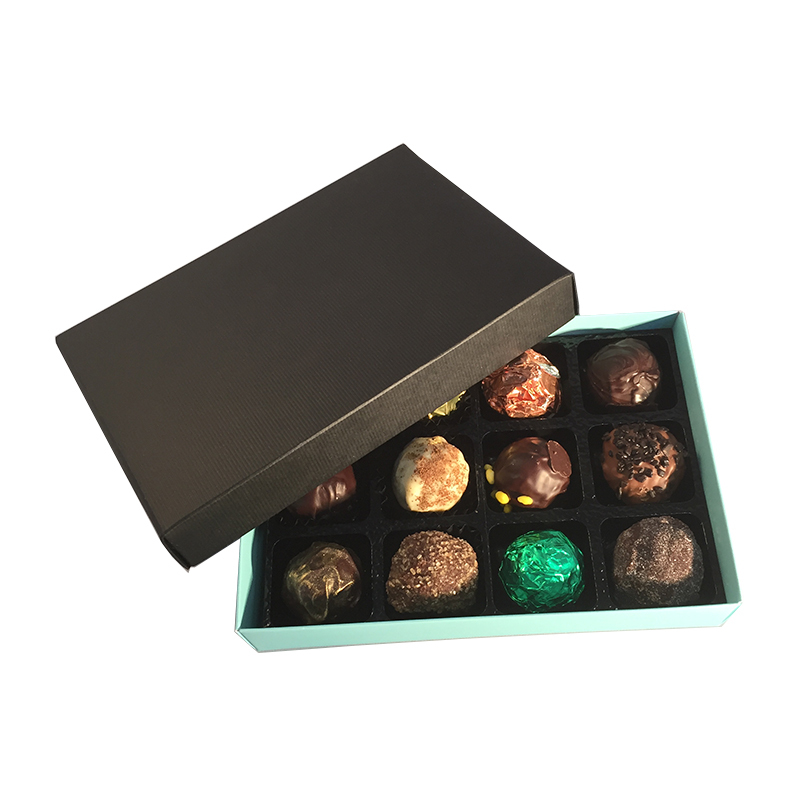 Dark chocolate ganache with a good splash of amaretto in a dark chocolate shell and topped with a toasted almond. 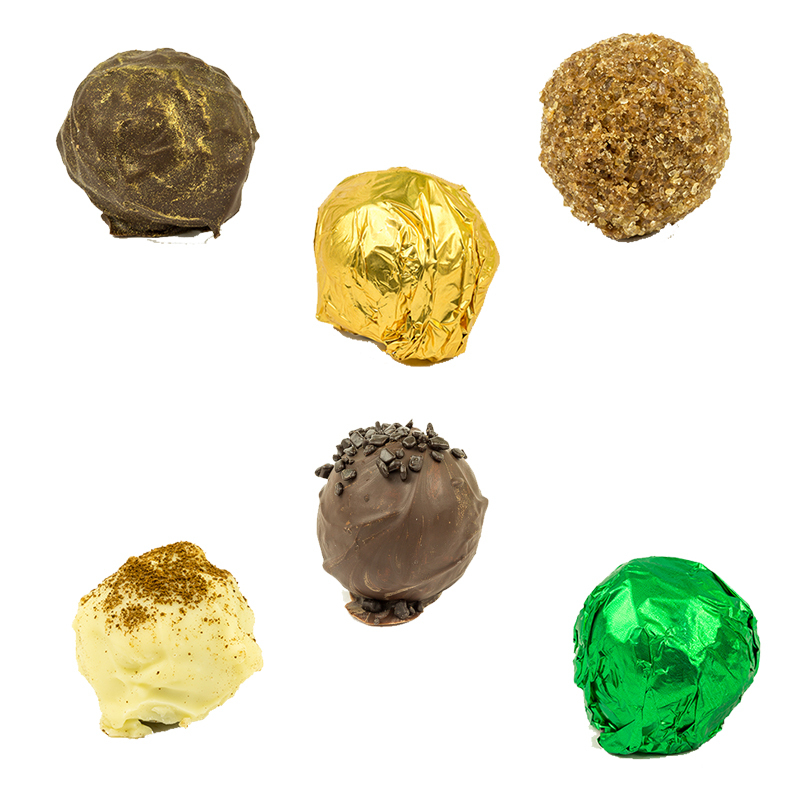 Salted caramel flavour dairy free chocolate ganache coated in dairy free milk chocolate and wrapped in gold foil. Dark chocolate orange ganache coated with dark chocolate and rolled in demerara sugar. Dark chocolate ganache oozing with champagne, rolled in dark chocolate with gold dusting. Lavender fondant encased with dark chocolate and natural lavender infused sugar balls. Dark chocolate ganache with plenty of kirsche and black cherry flavour enrobed in more dark chocolate and rolled in sugar. Coffee infused dairy free milk chocolate rolled in dairy free white chocolate and sprinkled with ground Atkinson’s coffee. 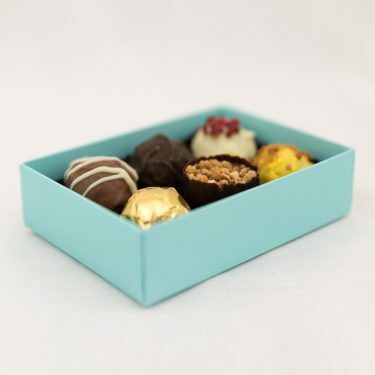 Sugar, cocoa mass, cocoa butter, glucose syrup, SOYA cream*, emulsifier: SOYA lecithin, flavouring/colouring: natural lemon, natural vanilla, sorbitol syrup, lemon juice concentrate, modified starch, propylene glycol, citric acid, ethyl alcohol, carrot extract, maltodextrin, colouring: E100. Sugar, cocoa mass, cocoa butter, mint flavour, glucose syrup, SOYA cream*, emulsifier: SOYA lecithin. Sugar, cocoa mass, cocoa butter, SOYA cream*, glucose syrup, emulsifier: SOYA lecithin, flavourings: natural coconut and vanilla, dried coconut (preservative SULPHUR DIOXIDE). Sugar, cocoa mass, cocoa butter, glucose syrup, SOYA cream*, emulsifier: SOYA lecithin, fat reduced cocoa powder, traces of vegetable oil. Sugar, cocoa mass, cocoa butter, emulsifier: SOYA lecithin, SOYA cream*, glucose syrup, dried whole raspberry, raspberry flavour and colour: invert sugar syrup, beetroot concentrate, raspberry and blueberry juice, ethyl alcohol, acidifier: citric acid, modified starch. Sugar, cocoa mass, cocoa butter, amaretto, emulsifier: SOYA lecithin, SOYA cream*, glucose syrup, toasted almonds (NUTS). Sugar, cocoa mass, cocoa butter, emulsifier: SOYA lecithin, SOYA cream*, glucose syrup, salted caramel flavouring (allergen free). Sugar, cocoa mass, cocoa butter, SOYA cream*, sorbitol syrup, orange juice concentrate, modified STARCH, citric acid, carrot extract, maltodextrin, vegetable oil, glucose syrup, fat reduced cocoa powder, emulsifier: SOYA lecithin, natural vanilla. Sugar, cocoa mass, cocoa butter, Marc de Champagne, emulsifier SOYA lecithin, SOYA cream*, glucose syrup. Gold dusting: E555, E172, E171. 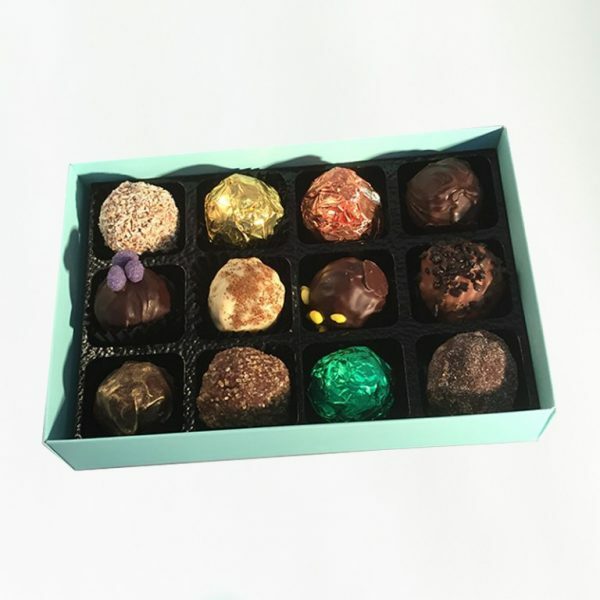 Sugar, cocoa mass, cocoa butter, emulsifier: SOYA lecithin, water, natural lavender flavour and colour. Sugar, cocoa mass, cocoa butter, kirsche, glucose syrup, SOYA cream*, emulsifier: SOYA lecithin, natural vanilla, cherry flavour: flavouring substances, flavouring preparations, propylene glycol (E1520). Sugar, cocoa butter, rice syrup, rice flour, cocoa mass, Atkinson’s espresso coffee, emulsifier: sunflower lecithin, SOYA cream*, glucose syrup.